Every time there's a stranded vehicle on the side of the road and a motorist stops to help, Avalokiteshvara Bodhisattva has manifested herself. Those characteristics of wisdom and compassion are the characteristics of all beings. All Buddhas. We all have that potential. It's just a matter of awakening it. You awaken it by realizing there's no separation between self and other. Avalokiteshvara is the bodhisattva who hears the cries of the world and embodies the compassion of the buddhas. When we see and hear the suffering of others and respond to that suffering, we are the heads and arms of the bodhisattva. 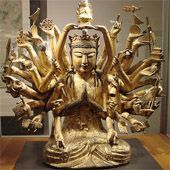 The bodhisattva has more heads and arms than anyone can count! Mere suffering exists, no sufferer is found. May response to suffering be unhindered.